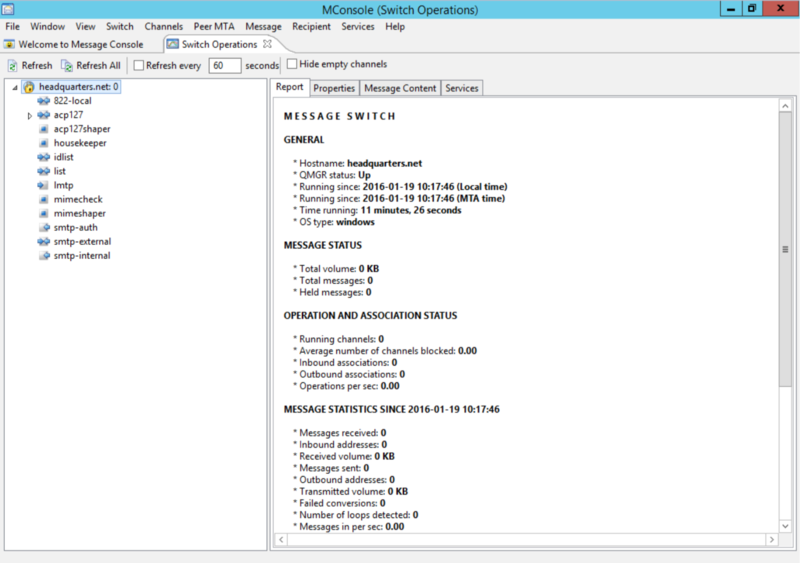 MConsole (Message Console) is Isode's central tool for messaging system Configuration and Operational management for both Internet and X.400 Messaging deployments. On this page you'll find information on MConsole Operational Management features for both SMTP and X.400 deployments. MConsole is a GUI management tool, with multiple views, that connects to one or more M-Switch servers as illustrated above using the SOM protocol described below. MConsole also connects to the Audit Database (described below) and to the M-Vault directory for M-Switch configuration management. 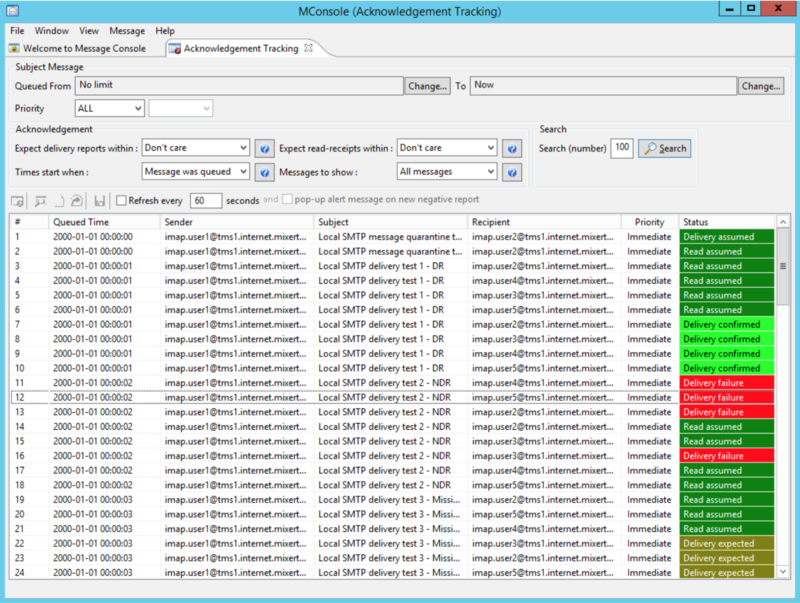 MConsole's Switch-view mode provides a monitoring oriented view of one or more M-Switch instances, with a hierarchical view of objects in the left hand window, and information on a selected object in the right hand window. Information on each M-Switch channel. Channels are a logical grouping of messages for different protocol, delivery, conversion and management functions. For example, one or more channels may be associated with SMTP email transfer. This will include the number of messages, message delay and number of the channel processes currently running. Show inbound and outbound connections associated with peer MTAs, including permanent and scheduled connections. Overall queue status, including number and volume of messages in the queue, and processing totals. Graphical display of important operational information, such as number of messages and number of channels running. the content of messages that are in the queue and additional envelope information read from the message queue. Disabling channels and peer MTAs, for inbound and/or outbound connections. Add (or clear) a configurable for all components (Channels, peer MTAs, messages, recipients). Request immediate processing (i.e., over-ride normal scheduling) for channels, peer MTAs, and messages. Request reprocessing of a message (or all messages for a peer MTA). Delete messages or individual recipients from the queue (no other actions). Redirect a message or selected recipients to another address. Forward a message (message content) to any recipient. Time out messages or individual recipients. M-Switch will behave as if the message had timed out, and send appropriate delivery reports. Non-deliver messages or individual recipients, with reason code selected by the operator. M-Switch will then non-deliver the message. Limit the priority of message that is processed by a channel or the whole MTA (all channels). This is useful in periods of high activity to restrict message processing to higher priority messages, and in support of military "minimize" condition. M-Switch writes audit logs that records information on messages transferred, and the location of where each message is archived (so that management tools can access message content). These logs are processed into an Audit Database. Flexible searching for messages (using information in the audit database), based on time period, message parameters such as originator and message id, and message handling stated (delivered, transferred, quarantined, deleted etc.). Searching for messages on a single MTA or on all MTAs handled by the audit database. Display of key parameters of each message matched. Display of SMTP and X.400 Message Content, retrieved from the online archive via SOM access to M-Switch. View of the delivery reports (X.400 DRs and/or SMTP DSNs) and read receipts (X.400 IPNs and SMTP MDNs) associated with each message. Forward SMTP and X.400 messages stored in archive to any recipient, with operator comment using a user agent view. To track errors, in particular delivery reports. This will give the operator immediate information about problems, and enable the operator to take pro-active action, such as forwarding a mis-addressed message. To warn about delay in delivery report or read receipt. This can facilitate detecting operational problems, and ensure that messages are correctly delivered and processed. Acknowledgement view can provide automatic refresh, to facilitate directory operator tracking of problems. Further information is provided in the whitepaper [Using Message Acknowledgements for Tracking, Correlation and Fire & Forget]. Some remote systems will not provide reliable acknowledgements, and so it makes sense to exclude them from message correlation. Information on “Alertable Missing Acknowledgements” is stored in the Audit Database using a flexible rules based approach and can be managed with MConsole. The audit database is part of the system supporting message quarantine management, which includes an email interface, for sending HTML messages to users with a list of messages in quarantine. The email interface is provided as a script, which can be customized for each installation. The interface provides a list of the messages, and a URL which causes the message to be released from quarantine. Release works by updating the status in the audit database to "Pending resubmission". A background process releases messages from the quarantine and marks status to "Resubmitted after quarantine". Isode's approach to operational management is client/server. Access to and control of M-Switch operational information is provided using the SOM protocol to the M-Switch Queue Manager. SOM provides the framework for implementing Isode tools, including MConsole, the Event Viewer, and Quarantine message resubmission. SOM is also intended for integration with third party tools and Isode provides a SOM Client API to anable this. Configure auto-actions, such as auto-forward. These are managed through the message store, in a manner similar to that of a P7 client. Mailbox monitoring, to show unread messages and to help deal with messages that have not been read. Shows information on a specific message. Show information on a specific connection to the Message Store. Where mailboxes are provided by a local X.400 Message store, the X.400 Message Stores view allows detailed management of the local mailboxes, including; backup/restore, connection monitoring, message management and forwarding, auto-action management and monitoring unread messages. Locate an existing entry. MConsole will add the user’s OR Address to this entry.